Thanks for the extra mile for the consultation session. 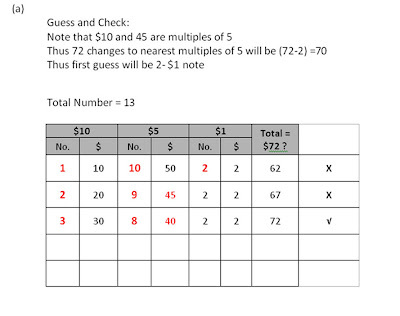 (a) A bill of $72 was paid with $10, $5 and $1 notes. If 13 notes were used for payments, how many notes of each kind were used? (b) Vanessa and Bobby had some telephone cards. 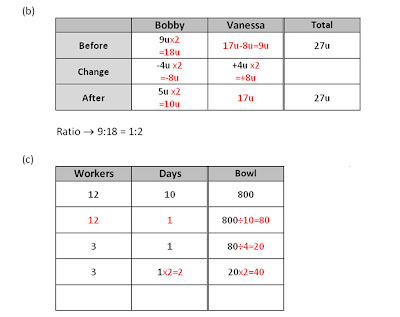 AfterBobby gave 4/9 of his cards to Vanessa, the ratio of the number of Bobby’s cards to the number of Vanessa’s cards became 10 : 17. What was the ratio of the number of Vanessa’s cards to the number of Bobby’s cards at first? (c) 12 workers took 10 days to make 800 bowls. How many days 3 workers need to make 40 bowls?